The world’s first ambulatory hotel comes a little too close to a powerful witch’s demesne in this sequel to Warren the 13th and the All-Seeing Eye (2015). A gooey accident involving a pineapple sarsaparilla and an important control panel sets off an escalating chain of calamities that leaves the Warren Hotel in the charge of “Worrin,” a malign shape-shifter who has assumed the identity of its 12-year-old manager, Warren. Adding to the woes, the hotel’s security head, lavishly tattooed witch hunter Beatrice, has fallen into the clutches of Calvina—a witch queen so evil that many of the pages on which she appears are printed white on black. 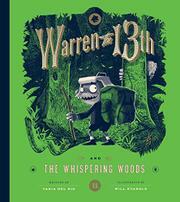 In a double-columned narrative festooned throughout with macabre green-and-black illustrations that thicken the gothic air considerably (particularly as the real Warren, resourceful and intrepid though he may be, is depicted as an uncommonly uglfy lad with gray skin), dismal turns abound, but all are met with fortitude and ingenious stratagems. Weirdness abounds: an apelike but refined “sap-squatch” figures prominently; along with the rest of his motley staff, Warren is thrilled to discover that walking on giant legs isn’t his beloved hotel’s only means of getting around. A visiting journalist is the one dark-skinned character in an otherwise largely white human cast.